Those with a variety of types of arthritis and related conditions, including fibromyalgia, osteoarthritis, and osteoporosis can benefit from this tape. It is also recommended for MS clients who need to exercise seated. It shows a range of ages and levels, and can be done while sitting, making it also an excellent, basic exercise program for anyone in a wheelchair, or for those who need or simply prefer to exercise while seated. How is this video different? 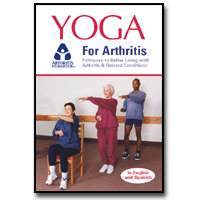 Created for the Arthritis Foundation by exercise and physical therapists, this state-of-the-art, yoga-based program includes breathing techniques, stretches, strengthening exercises, an aerobic section, and a total body relaxation. All five participants on this tape have various types of arthritis (one has MS), work at different levels, and range in age from 35 to 72. "An excellent supplement to a general conditioning program for the patient with chronic pain." "The low-key presentation and non-competitive nature of the tape makes for an easy-to-follow and friendly session that all viewers can feel capable of achieving."